Congratulations on celebrating 195 years of independence. Charles Boyd and everyone at The Costa Rica Team is so grateful to call this beautiful and free country our home. Whether natives to Costa Rica or ex-pats that have adopted this amazing land, we are forever thankful to be able to live, work and invest here. We believe in Costa Rica’s free and independent culture that allows everyone to live the Pure Life. Last night children with homemade lanterns paraded through the streets of Jaco, to symbolize the journey that brought the message to Costa Rica of Central American independence in the 19th-century. The La Luz de la Libertad (The Light of Liberty) is celebrated with these homemade lanterns. The crowd also got to enjoy our local fire fighters and fire truck, a local band and the towns people joining in the procession as it passed. Today’s parade in Jaco was a testament to the pride and love that all locals feel for this incredible nation. Children dancing in traditional dress filled the streets with joy, as others marched along with the high school marching band. Horses were prancing, done up in their finest, as masterful horsemen had them dancing. Some children were also led along sitting excitedly on these majestic creatures. Fun was had by all and Charles Boyd was happy to see everyone celebrating such a momentous occasion. If you think you would like to come down and feel this deep sense of independence and freedom, we hope you will get in touch with The Costa Rica Team so we can show you the ropes. 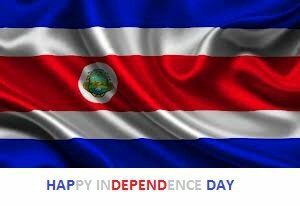 Have a blessed Independence Day Costa Rica!! !